Chocolate truffles are an indulgent treat, now you can learn how to make chocolate truffles to share with family and friends. As its Christmas why not try these easy to make Truffles, they will make an extra-special gift for your friends and families, and they make an equally special ending to any special meal – served with liqueurs and coffee. 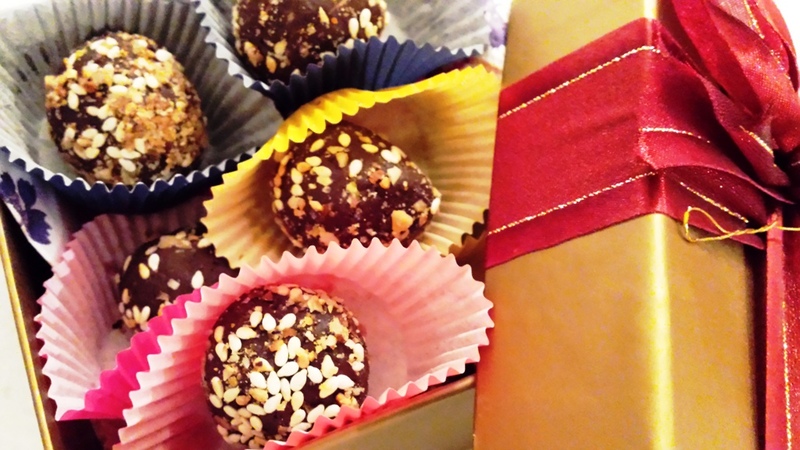 Chocolate truffles, beautifully wrapped in boxes, will put a smile on anyone’s face. Truffles are perfect for dinner parties – you can make them beforehand, then pop them in the fridge until you’re ready to serve. Edible gifts made with Love, beautifully wrapped can only be very special and a pleasure to share . Chocolate and alcohol together makes a good combination so don’t be shy , you can add alcohol of your choice for added flavour – your drinks cabinet can give you a clue!!!! Chop the chocolate and tip into a large bowl. Put the cream in a pan over a medium heat and let it heat up. As soon as tiny bubbles start to appear, add the chocolate pieces. Remove from heat, add the clementine, butter. Stir well until the chocolate starts to melt. Add thecream together until you have a smooth mixture. (If the mixture splits slightly, don’t worry, you can bring it right by adding a splash of boiling water). Add any flavourings to the truffle mix at this stage (divide the mixture between bowls and mix in liqueurs or other flavourings, a tsp at a time, to taste. Try whiskey, bourbon, Grand Marnier, coconut rum or the zest and juice of an orange), or leave plain. Cool and chill for at least 4 hrs. To shape the truffles, dip a melon baller in hot water and scoop up balls of the mixture (if you don’t have a melon baller use a teaspoon), then drop the truffles onto greaseproof paper. 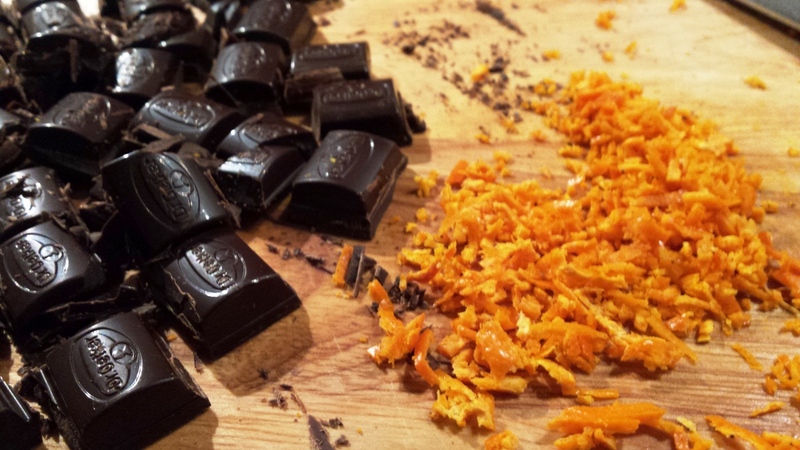 Or lightly coat your hands in flavourless oil (such as sunflower) and roll the truffles between your palms. Coat your truffles immediately after shaping. Place your chosen toppings into a bowl and gently roll the truffles until evenly coated, then chill on greaseproof paper. Coating suggestion as above: crushed, shelled pistachio nuts; lightly toasted desiccated coconut; cocoa powder, etc. To give as presents, place a few truffles in individual foil or paper cases inside small, lined boxes tied with ribbon. Keep in the fridge until you’re ready to give them. As far as the flavours and coatings are concerned, be brave and experiment on combining different ingredients. I coated my chilli flavoured truffles with crushed meringue for a sweet note on the chilli bite and it worked.